THE GOUGH MAP: AN INVESTIGATION: The provenance of a historical ‘tour de force’ in English cartography. 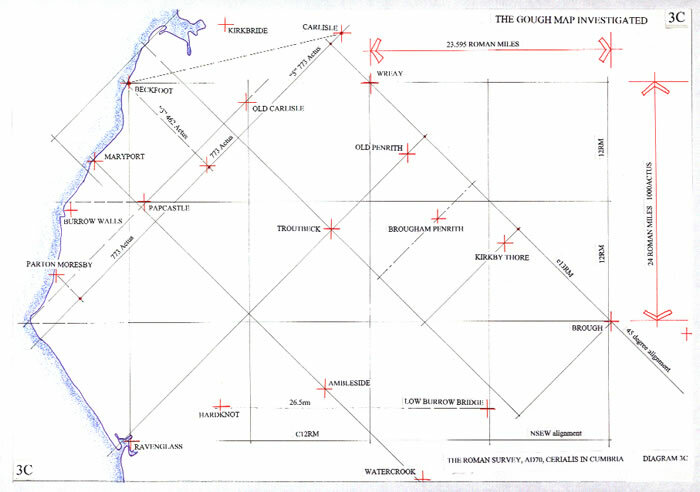 The Gough Map1, generally referred to in glowing terms because of its apparent accuracy is believed to be the product of a cosmographer working in Britain cAD1360. It is also thought to be a redrafting of a compilation made cAD12802. Depicting Britannia, it is 553 x 1164 mm formed by two skins of vellum which are the base medium for the pen, ink and coloured wash map (Millea1, 2008). It has a depiction of towns similar to the Tabula Peutingeriana (Ferrar3, 2005) with drawings of buildings, including churches, used to illustrate their position. The rivers, which are a major feature of the map are in some instances drawn geographically, whilst others are purely diagrammatic, with each ending in (or commencing in) a lake or spring. The third set of features within the confines of the coastal form, are a series of red lines with Latin numbers appended. These have been variously thought of as roads with inter-distances, much as shown on the Tabula Peutingeriana, or, merely as the inter-town distances as described in the Itinerarium Antonini (Rivet4, 1979), without inferring a road route (Margary51955). The coastal form may be described in three parts; England is drawn with a map form surpassing that of Claudius Ptolemy (Stevenson6, 1932 & Map 5B), with geographic features correctly shown: Scotland is drawn as a northern protuberance mimicking a digit of the hand, and as such it indicates either the draughtsman had no personal knowledge of its physical shape, and was copying what it was purported to be, perhaps from the first and missing page of the Tabula Peutingeriana (map 2B), or, it was a guess from a written description: Wales is depicted overlarge whilst maintaining a semblance of reality in its north/south extremes, but is missing three crucial features; The Lleyn peninsula, Cardigan Bay and a proper St. David’s peninsula. It is as though geographic time has been reversed and the land lost to the sea in Cardigan Bay (Steers7, 1964 p148) has been restored. Prior to 690, it is from the Roman occupation that the probable normal usage of maps, itineraries and geographical data can be traced, as is discussed later. In c690, a “Cosmographiorum codici mirandi operis”, described by the Venerable Bede8 as a finely executed “manuscript of the cosmographers” was extant in a monastery in Yorkshire. Then we read in his “Ecclesiastical History” a full geographical description of Britannia. Thus in the monastic houses the basis for a geographical study of Britannia may have been borne, evidenced by, and culminating in the works of, Gerald of Wales, Geoffrey of Monmouth, Matthew Paris and of course Richard of Haldingham, who has ascribed to him the Hereford9 Mappamundi, dated to c1290. In “English Maps, A History”, Delano-Smith and Kain10 argue it is possible that a copy of the “Almagest” of Claudius Ptolemy11, c150, could have been available in Britannia during 1250-1350AD. They state; ”By about 1265, it had occurred to Roger Bacon12, Franciscan Friar and teacher at the University of Oxford, that the system described in the Almagest could indeed be used in making a map of the world. Bacon’s description of a co-ordinate system based on parallels and meridians is found in his OPUS MAIUS (part 4) but his map, which must have looked very different from any mappa mundi, is now lost”. They complete the paragraph stating that the Almagest is so very different from the Geography of Claudius Ptolemy: there are no lists of co-ordinates. However, as is explained later in this text the concept must have been acquired and used. However we must ask if the 14th century in Britannia was a place where surveyors could ply their trade. The late 13th century witnessed an extra-ordinary bout of wars of conquest in Britannia. In 1277, Edward 1st undertook a campaign against the Welsh. This led to the establishment of a remarkable set of castles, from Flint to Aberystwyth which were potent symbols of Plantagenet rule. In Scotland there was the problem of succession to Alexander 3rd, who died in 1282. War ensued and the Scots raided northern England to as far south as York in 1322 and again in 1327. Finally in 1328 the treaty of Edinburgh assured Scotland’s independence. Seemingly safe against Scotland, although they invaded again in 1346, but were defeated at Durham, Edward 3rd invaded France to regain his lands, confiscated by King Philip IV of France. These are the Anglo-French wars from 1337 to 1453. Then the Black Death arrived. From an initial outbreak in June 1348 after 18 months or so, that plague was so virulent in England that just under half the population died and settlements shrunk by as much as 60 percent. That is of course if they were not completely deserted as the records show so many were. Further outbreaks were in 1361 and 1369, with others at more or less a decade apart. Thus it is against this backdrop that two maps, the latter dated to 1360 were produced. 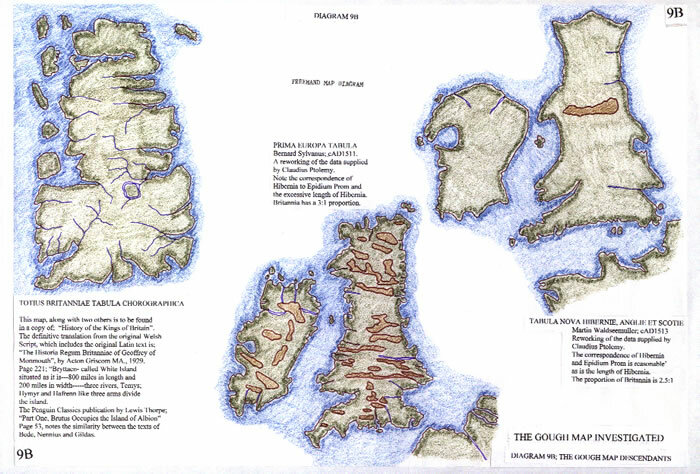 There are very few extant maps from the period prior to the Gough map compilation (D-Smith/Kain10 1999). 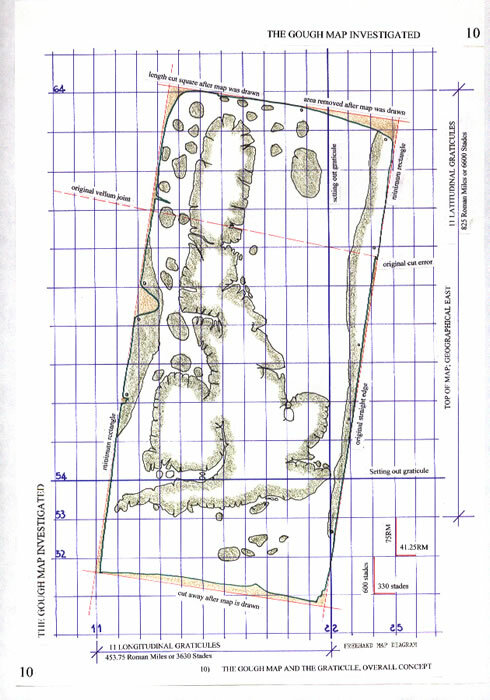 We do however have ancient descriptive texts indicating the shape and form of Britannia (Map2A). But, only one geographic feature appears to be a constant in all of the extant data concerning Britannia, CANTIUM PROMONTORY now the South Foreland. Thus we read13 in Diodorus Siculus, V, 21; Caesar BG, V.13.1; Strabo, 1.4.3 etc; Claudius Ptolemy, II. 3. 3 and II. 3. 4, and even Venerable Bede, i.15 etc., that Cantium Promontory is listed as the defining point of Britannia, with distances for its overall coastline and to the coast of Gaul given. Map diagrams 2A & C illustrate the changing landscape. But to draw a map, survey data is required. There is scepticism in many quarters regarding a Roman World Survey, but T. P. Wiseman18 (1992; 25-6) argues cogently in favour. He describes the data available in two texts from late antiquity, probably written in the late 4th or early 5th centuries AD. One by Julius Honorius, the orator, and the other from a cosmography attributed to Aethicus. Basically Julius Caesar ordered a survey of the whole world,(Roman dominated), which was completed in some 32 years by four specially appointed commissioners. These facts are recorded upon the Ebstorf, Hereford and Cornwall Mappae Mundi. Hence, we can assume that Julius Caesar’s four commissioner’s report, the latest in 18 BC, and Augustus, Caesar’s adopted son, now Rome’s emperor, requires the world map to facilitate expanding the empire. Marcus Agrippa was entrusted with the project, but, given the preceding activity, he was only required to update the work of those commissioners. Indeed, according to R. K. Sherk19 (1974: 559, n. 80),”It was the conclusion of Klotz . . . that, although Agrippa had taken over much from Eratosthenes, he was a vir vere Romanus and accordingly gave a very high priority to Roman sources in the preparation of his map”. In fact, Agrippa’s task, continued by Vipsania Polla his sister, was actually completed by Augustus, as described in Pliny20 the Elder’s Natural History (3.16-17, 6.139). Thus when the Claudian21 Invasion of Britannia followed some 50 years later it can be assumed that the instruction to survey the island and add the information to the Roman World map would have been issued. The details of Roman surveying and their capabilities can be established from a study of the landscape positioning of their constructions, be they forts or roads. Thus, if the landscape positioning of Roman Forts (Map 4) is studied it becomes very apparent that a survey took place. An example from the first advance by ‘Cerialis’ into Cumbria, is quite definitive (Cornelli Taciti22). The date assigned to the Camps indicates that prior to the Agricolan Campaign, Cerialis advanced to Carlisle via the Stainmore Pass and Eden valley. When Agricola later moved north from Chester and York, forts were established, which from their survey connected landscape positioning obviously required a prior survey; that carried out within Cerialis’ first incursion. Thus the survey measure from the camp at Newton Kyme to Ilkley is 23 Roman Miles (Map 3A) and thence to Elslack a further 13 Roman Miles. This is a direct alignment along the Wharfe Valley and over Rombalds Moor, 36 Roman Miles in length. From Elslack the distance measures indicate an amazing survey feat. From Elslack to Overborough is 27.5 Roman Miles; from Elslack to Bainbridge is 27.5 Roman Miles and from Overborough to Ribchester is 27.5 Roman Miles. But these are not an alignment; they form two isosceles triangles in the landscape, and can only be the result of a full scale survey plot. 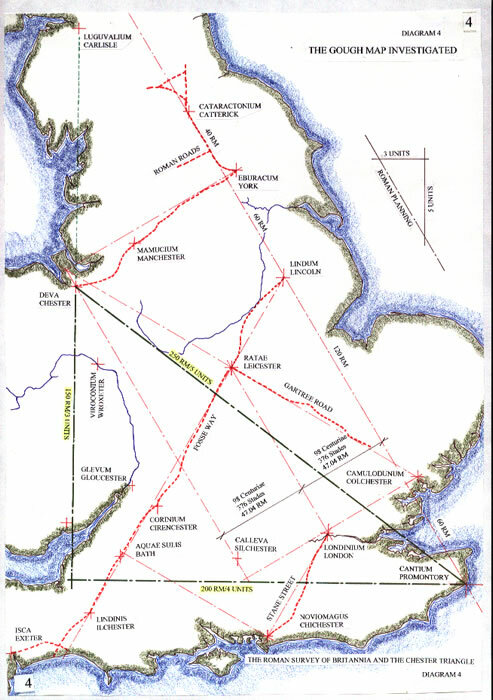 A similar investigation in the Eden Valley, Cumbria,(Maps 3B&C) indicates that the forts are so spaced along a 45 degree alignment as to be precisely 1/3, 2/3 and ½ distance spacing, being Brough to Kirkby Thore to Brougham and then Voreda via Wreay to Carlisle. From this alignment the fort at Troutbeck is perpendicularly sited at the same one third distance of 13 Roman Miles. Such accuracy would have required high quality survey techniques and basic mathematics. To control the layout, maps or plans would be a necessity to ensure the final layout was correct and to record it all for posterity. There is thus a positive basis from which to work to evaluate the Gough map. Because a facsimile was being used of known reduction, c80 percent actual size, it is obvious that any distances upon that facsimile would exhibit the same ratio of actual distance to scaled distance. But when measurements were taken to compare true distance to map distance, a fact appeared which made all the preparatory work unnecessary. The facsimile copy of the Gough map at c80 percent true size is such that in the 21st century we can use a simple millimetre scale rule and measure direct distances from the facsimile with no appreciable error, because 1mm represents 1 Roman Mile. The Roman Mile, Mille Passus of 5000 pedes, equal to 0.919118 statute miles or 1.4791 Km., was chosen for the simple fact that it had been the only unifying distance for much of Europe. It had been used on the Tabula Peutingeriana and within the text of the Itinerarium Provinciarum Antonini Augusti, and was still extant in Britannia throughout this period. Connor25(1987, p69) states, The length of the Mile (under) Roman influence is to be seen in the Saxon documents and this influence continued well beyond the Conquest. In the 14th century document, “Certa Mensura”, we read: 8 stades make 1 miliarium. (octo stadia unum miliare faciunt). 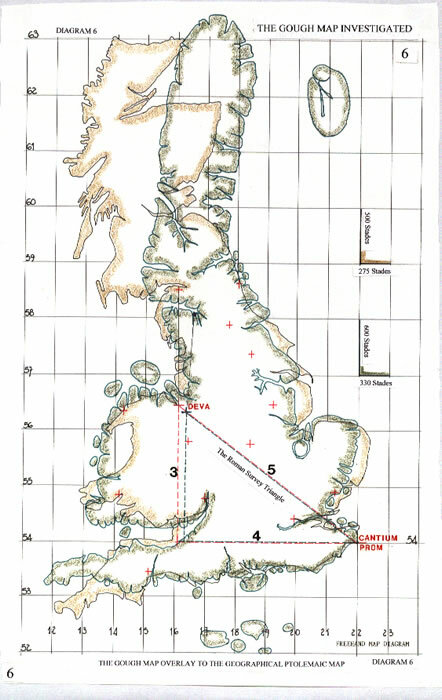 Having established that Cantium Promontory was an early cartographer’s reference point, it was assumed that any graticule would contain this as a specific marker, just as Claudius Ptolemy had chosen with his 22E:54N co-ordinates. The Roman World was measured as 75 Roman Miles per degree of Latitude, (with a circle of 27,000 Roman Miles, or 216,000 stadia, whereas the actual dimension is c216,400 stadia), thus any latitudinal measure which was apparent would, in all probability be a 75 Roman Mile multiple. But, before any lines can be drawn True map north or Geographical north must be established. The map is drawn with east to the top, but what east? It is certainly not geographical east. 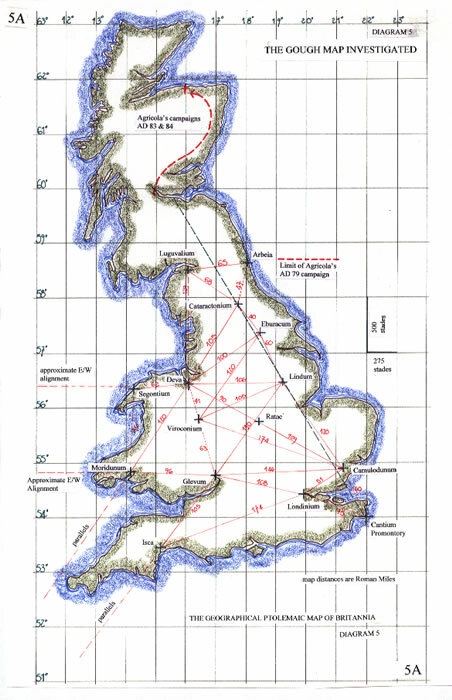 Earlier research (Ferrar & Richardson, 200323) had shown that in the landscape of Britannia there was a perfect 3:4:5 ratio triangle from Cantium Promontory to Deva, Chester (Map 4). It is formed by 150:200:250 Roman Miles. By drawing such a triangle based upon the hypotenuse from Cantium Promontory to Deva/Chester it was possible to ascertain a putative North /South and East/West alignment of any graticule, confirm the maps accuracy, and possibly infer is antecedents. The distance upon the Facsimile Gough map from Cantium Promontory to Deva/Chester is 290mm or 290 Roman Miles. This is inaccurate for a true distance of 250 Roman Miles, but the investigation is not over yet. Setting out a 3:4:5 ratio triangle based upon 290mm produces sides of 174mm and 232mm. Set this triangle upon the facsimile map and the graticule orientation is established, with the base side of the triangle directly aligned to Cantium Promontory and the north/south side providing a possible geographical north alignment (Map 6). The next task was to prove the graticules orientation, and here both Claudius Ptolemy and the Ordnance Survey aid our endeavours. Ptolemy has a longitude 18E, which virtually mimics the Ordnance Survey base longitude of 2 degrees west, now OS400.00 East24. That alignment when drawn on the facsimile of the Gough map is quite perfectly positioned and precisely parallel to the Cantium Promontory/Deva triangle graticule. But upon the facsimile map the putative 18E longitude is precisely 165mm from Cantium Promontory. Using the Ptolemaic base map, this is 4 degrees, and 165 = 4 x 41.25 Roman miles, which if realised as the 11 ratio of Claudius Ptolemy produces a perfect Latitudinal measure of 75 Roman Miles, the Roman World Measure. It is therefore completely feasible to draw upon the (facsimile) Gough Map a graticule of 41.25 x 75 Roman miles and this graticule will be a precise match of the original Claudius Ptolemy Graticule, ratio 11:20, and is of course capable of being scaled by c125 percent to produce the actual graticule on the Gough Map. To arrive at the Gough Map actual dimension we must increase those measurements by a factor of c1.25 (i.e. from c80 percent or 4/5 to 5/5). Thus 41.25 becomes c51.56mm and 75 becomes c93.75mm. But 51.56mm is very nearly a precise 2 inches (2.03 inches) and a near 2 uncia25, (2.0914). The 93.75mm is actually 3.691 inches. But, the cosmographer would have used a simple graticule, so simple in fact that it is a product of the mathematics. The graticule is in fact 2 inches x 3.66 inches, an 11/20 ratio in simple terms, formed from the 3.66 or 3 2/3 which is itself 11/3. The map size produces the perfect 11/20 ratio, with 11 x 11 graticules. But in drawing the complete graticule upon the facsimile, another enigma was solved. The Monk Gildas c570AD14, stated Britannia was 800 x 300 miles, which is precisely what the map indicates. Therefore at sometime prior to 500AD a map of sufficient accuracy must have been available for the assessment to be made that Britannia was a rectangle. The triangle has disappeared forever. To compare the Gough Map to a present day highly accurate map of Britannia, especially an Ordnance Survey map is fallacious. If a map is based upon a ratio of latitude to longitude, 20:11, for the whole of Britannia, when Britannia is at its most southerly 50N (that is a ratio of 0.642:1 or 7:11) and at its most northerly 58.5N (that is a ratio of 0.5225:1 or 5.75:11) then the average at 54.25N is 6.375:11, or 29/50. The Ptolemaic ratio of 20:11 is for 56.633N and therefore requires a completely new map to be constructed. It has been constructed for this and other research by the author, recalculating myriads of Ordnance Survey co-ordinates to provide a distance West and North(South) of Cantium Promontory using the ratio 20:11 or 500:275 stadia of 0.184 kilometres. 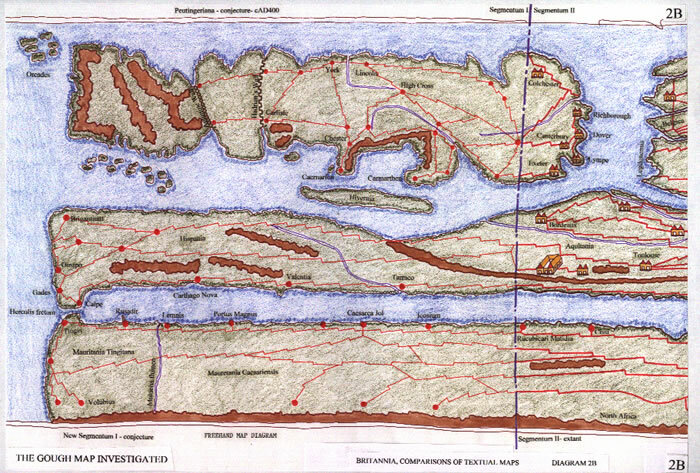 It has been entitled Geographical Ptolemaic Map (Map5A) and is the basis of all comparative maps in this paper. The actual Ptolemy map is illustrated for comparison as Map 5B. Thus having drawn a map of Britannia to those parameters, 11:20 ratio based upon one single point, Cantium Promontory, we can make direct comparisons. Having established the graticule for the Gough map, we may now read the longitude and latitudes of any place thereon. London is given the co-ordinates 20E/54N by Ptolemy and upon the Gough Map we can deduce the co-ordinates as 190 50’E / 540 27’N. But, as the diagram for London is drawn disproportionately large, the 20E is quite probable. The putative Roman Map of Britannia (Map 4) indicated that Deva/Chester was a precise 3:4:5 ratio triangle from Cantium Promontory and thus this could be used to locate Deva/Chester upon the graticules. But Ptolemy used 17° 30’E / 56° 45’N for Deva and the Gough Map indicates 16° 23’E / 56° 20’N. Thus it is a full degree west but roughly the same latitude. However, Deva upon the Gough Map is located by a precise 3:4:5 ratio triangle from Cantium Promontory, thus copying the Roman base map. For further comparison, Ptolemy’s York/Eburacum is 20E/57° 21’N; on the Gough Map, 18° 20’E/ 57° 06’N, but on the Geographical Ptolemy Map it is 18° 26’E / 57° 22’N. Thus we can deduce that the cosmographer had conflicting information and was using both Roman eastings and Ptolemaic northings. This is probable as Latitudes are easier to confirm, but longitudes are only possible from a direct measurement. Thus the survey carried out under Roman occupation would be an ideal source. When a list of the Ptolemaic Poleis co-ordinates is compared with the Gough Map co-ordinates (Table 1) there is a close comparison of the latitudes, but those Gough Map longitudes move to the west the more westerly the poleis. This of course reflects the geographical situation as opposed to Ptolemy’s north/south England. The westerly tilt is reality. For reasons which need not be discussed here, the Ptolemaic map has a most northerly latitude, Novantarum peninsula and promontory at 21E/61° 40’N. 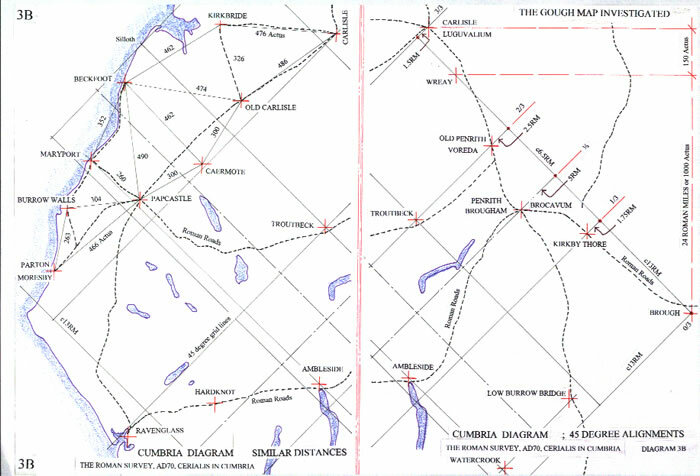 The Gough Map terminates Scotland at 63° 27’N and the Geographical Ptolemaic Map at c63°N. The actual latitude for the far north of Scotland is c58° 30’N. Hence we see that latitudes which can be physically measured are generally representative of the correct position when a like for like comparison is made. But, as only measurement would enable the longitudes to be established, errors with the coastline and hence Poleis close to the coast produce the greatest errors on the Gough Map. Thus with the Gough Map exhibiting the longitude and latitude graticule of Claudius Ptolemy we can only conclude that during the Roman occupation of Britannia from 44 to 410AD (Frere21 1967), knowledge of Claudius Ptolemy’s methodology was transmitted back through the Roman governance system to Britannia. This enabled the map to be drawn using Roman parameters of 75 Roman miles per degree of latitude. Ptolemy worked in Alexandria and we assume wrote all of his work in Greek, which was well understood by some Romans. Surely though we are entitled to assume that in the Roman Empire, speaking Latin, this monumental work would , if only in part have been automatically translated and disseminated throughout the hierarchy of the Roman State. The landscape positioning of places by a construct of actual degrees East and North for Britannia could not have been taken from the Almagest of Claudius Ptolemy. Therefore, we either accept a Roman basis for the survey and subsequent map, or, assume that the Geography of Claudius Ptolemy was available to cosmographers in the early 13th century. Either assumption requires a paradigm shift in the perception of early maps and also the surveying capabilities of the Romans. The cosmographer was required to position a proportional rectangle, 11:20 ratio upon the Vellum chosen as the medium for the map base (Map 1). Thus an overall graticule may be drawn which allows for its twisting to fit a larger Vellum skin. Therefore we can deduce a minimum size for the original Vellum piece from the graticule required to draw the actual map. The central and basic shape of the map is 11 longitudes and 11 latitudes, which is in fact a perfect 11:20 ratio being 22 inches by 40 inches. But the natural overall graticule is 28 inches by 47.58 inches, and therefore the probable minimum size for the Vellum skin. These dimensions produce a quite remarkable fit to the actual final Vellum size, not only because the corner extremities are denoted by the graticule but also surprisingly, the 11 longitudes at 22 inches is 558.8mm or 55cm, the given width of the map. Map diagram 10 illustrates this fact. The length at 47.58 inches is 1209mm or 120.9cm. The given length is c116cm. Thus we can assume that the graticule was drawn in charcoal on the Vellum, the angle of alignment maximising the height of the map from what is the maps top right corner to the bottom left corner. These are in fact c22E/51N and c15E/64N. Then, when the map was completed, the Vellum skin was cut to a shape, and then to a rectangle based on the top or east face. Having established the graticule to be utilised as the frame for the map, specific Poleis were located. That is those whose longitude and latitude could be fairly established from previous research. These are obviously all of the named Legionary Fortresses and the major Civitates which coincide with the Roman Survey proforma as Map 4 indicates. Thus there was in place a locator for the major coastal geographical features of Britannia. These included, Cantium Promontory; Chichester; Exeter; Gloucester; Carmarthen; Caernarvon; Chester; Carlisle; Tynemouth and Jarrow/Monkwearmouth; York; Lincoln and Colchester. 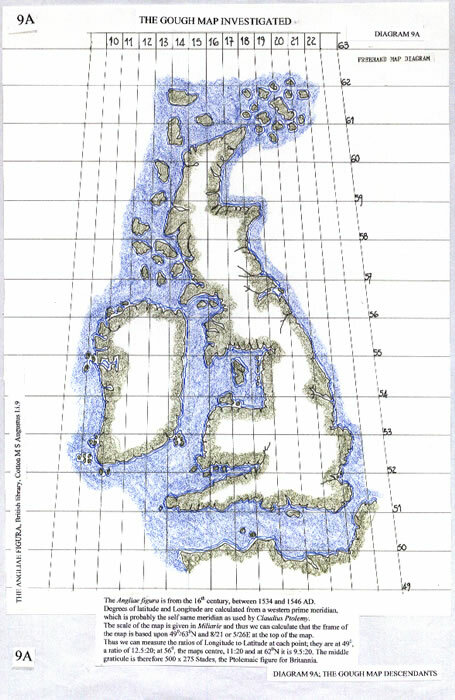 The coastal plot can then be drawn in charcoal as an outline, including the major rivers such as the Thames, Severn and Dee plus the major estuaries such as the Solway Firth; Clyde; Firth of Forth; Tyne and Humber, and with The Wash as a significant marker. The minor rivers would not be located until the full numbers of Poleis were located within the coastal frame. Using the major Poleis as locators, the minor towns and villages can now be positioned upon the graticule. Many would be known only as a certain walking distance towards another place. 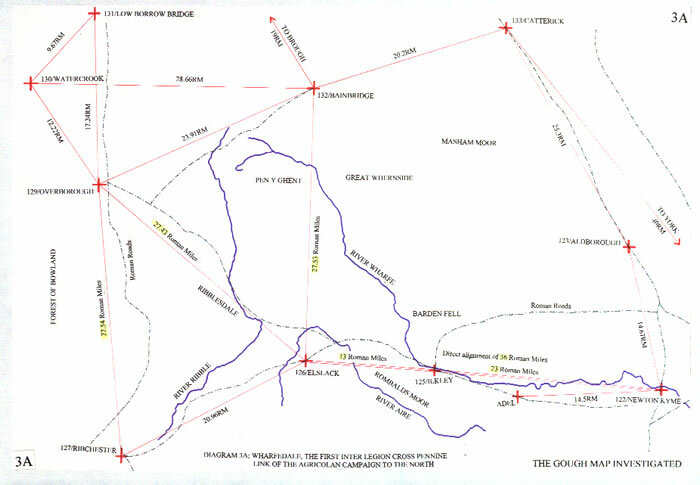 The Tabula Peutingeriana and the Antonine Itinerary would have provided more exact information, and, as they are expressed in Roman miles, is it any surprise that the Gough Map is also a Roman Mile compilation. 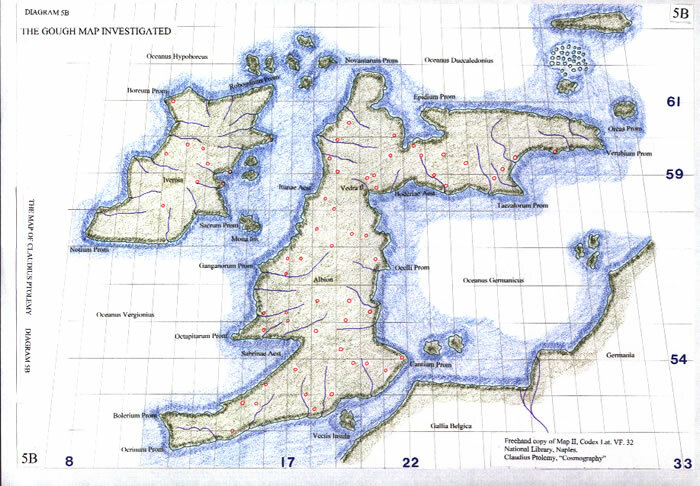 When these are located the actual coastline can be drawn in ink, with the rivers, both major and minor added appropriately. Some to a correct geographical configuration and others quite fancifully expressed. Finally names can be added and text for historical notation. At this stage prior to any colour wash being added the charcoal graticule could be removed,(even if that graticule had only one or two lines in each direction) no doubt using Bread as an eraser. It would appear that the rivers and coastline colour were added prior to the lettering in Red, the notes actually in the sea area were then added and the final colour wash applied. Thus the map could be assembled without the necessity for major adjustment to its constituent parts. Finally the Vellum skins were cut to a required size and later, to the near perfect rectangle we now see. The Gough Map is the descendant of a mapping tradition commenced by Greek mathematicians and then Librarians in Alexandria, which probably spurred one of Rome’s greatest rulers, Julius Caesar, to instigate a survey of the Roman World. Claudius Ptolemy was beneficiary of a large geographical/cosmographical treatise by Marinus of Tyre, who was no doubt the original recipient of the Roman survey information. He would also have had the words of Strabo who used the original text by Eratosthenes, to write his ‘Geographia’. The Roman Army surveyed Britannia and produced an accurate map, probably of the whole island as the Ptolemaic data indicates. The Ptolemaic construct of maps was transmitted back through the Roman governance system and in the latter days of the Empire accurate Roman maps were available. There were also diagrams such as the Tabula Peutingeriana, texts such as the Itinerarium Antonini and lists such as the Notitia Dignatum and latterly the Ravenna Cosmography (both internet available). The monastic system preserved these texts and maps which led to a cosmographer being able to construct the forerunner of the Gough Map. This is a quite remarkable, original and accurate construct for the age. But should we be thanking the Romans? At this point in the investigation it is possible to opine that the base map was copied from the Roman Survey of Britannia drawn to the parameters laid down by Claudius Ptolemy. But, that requires a paradigm shift in the perceived date for the data of Claudius Ptolemy to have been available in Britannia. The original data is now probably lost due to the dissolution of the monasteries c1546AD, and unfortunately we do not have an extant Roman base map, thus we can only hypothesize. Thus even after 200 years we see the same base map for England and Wales used, but, with a revised Scotland, thus producing a reasonably acceptable Britannia. If Scotland was revised, why was Wales not corrected to indicate the Lleyn Peninsula and Cardigan Bay? Was the base map purely a late Roman Map of England, with Wales and Scotland merely as indicative shapes? At this period in the occupation by Rome, there was little interest in Wales and none at all in the area north of the Hadrianic Wall. Was Wales never resurveyed prior to the sixteenth century such that it could be accurately drawn? Was Scotland resurveyed or did another early map appear in a monastery during King Henry VIII’s problems with the Church, c1509-1547, thus allowing the anonymous manuscript map ANGLIAE FIGURA (c1534-1546)(map9A) and George Lily’s map of c1546 to be quite plausible? The former is drawn on an 11:20 graticule of 500:275 stadia, as Ptolemaic maps. However the continental maps were exhibiting a map form akin to the early 11th century English maps. (map 9B). For the better governance of the country, using data collected for the Domesday Survey, a picture of Britannia was required. This could be used to determine the simplest of data, the extent of the realm, and provide a tool for the future control of that realm. This would be a very potent tool for any King. Did Edward 1st require an aggrandised Wales to be shown on the map to spin the case for War? Was the 1280AD map drawn to exaggerate the land available? Having a copy of a Roman base map and the texts of “Cosmographers” found in the monasteries that had perhaps purchased them, or been fortunate enough to copy them for future profit, a group of monks/clerics collated and finally drew the forerunner to, and then the Gough Map. It is unlikely that this was in a northern monastery as they had been ransacked several times. Therefore it is the more likely the place is in the hinterland of England. Why not Wales? Would a Welsh cleric not know of the Lleyn Peninsula and Bardsey Island Monastery founded c516AD, and a place of pilgrimage. It is not on the Gough Map. But Wales was conquered by Edward 1st. Thus we must look to a large English monastic establishment, or perhaps its equivalent, the University of Oxford, for the maps author, and in one which held a considerable library, and was in all probability generally untouched by the ravages of the wars plaguing Britannia. This search no doubt continues in academia. M J Ferrar December 1992/2008. 31) Petuaria 20 40 56 40 Brough on H.
NOTE: The Poleis noted as corresponding to the GOUGH MAP towns are taken from the text “Claudius Ptolemy, Falsification, Regimentation or Symmetry”, and were originally calculated to the co-ordinates derived from the Geographical Ptolemaic map, but are here quoted as direct readings from the graticule of the GOUGH MAP. 1) Millea Nick, (2008,) “The Gough Map: The Map of Great Britain circa AD1360”.The Bodleian Library, Oxford. Copy of map on its website with an interlink to the research map at The Queen’s University, Belfast. The Mapping the Realm Website will be found at: www.qub.ac.uk/urban mapping/gough map, and is the research leader into the maps construct. See Imago Mundi, Volume 61, issue 1, January 2009, pp1-28. 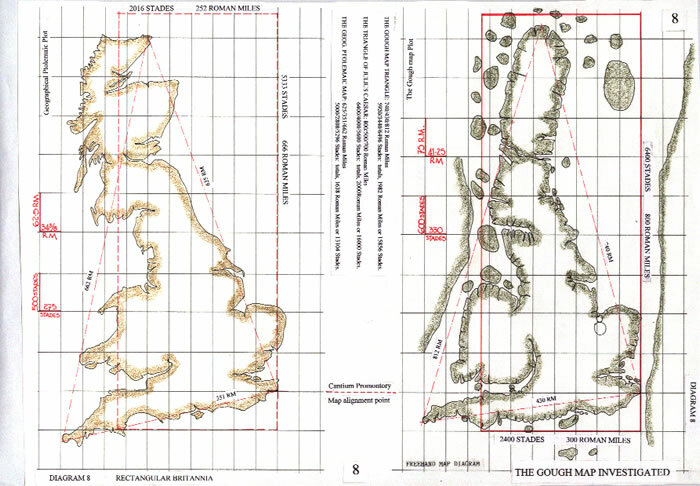 2) Birkholz, D. (2006) “The Gough Map Revisited: Thomas Butler’s, The Mape oft Ynglound, c1547-1554. Imago Mundi, Vol 58, No1, Feb 2006, pp23-47. 3) Ferrar M J, (2005,) “The Venerable Bede and the Tabula Peutingeriana”. The Cartographical Journal, vol. 42, No2, September 2005. 4) Rivet, ALF and Smith C, (1979), “The Place Names of Britain”, B C A 1979 and 1981. Text includes Antonine Itinerary, Notitia Dignatum, etc. 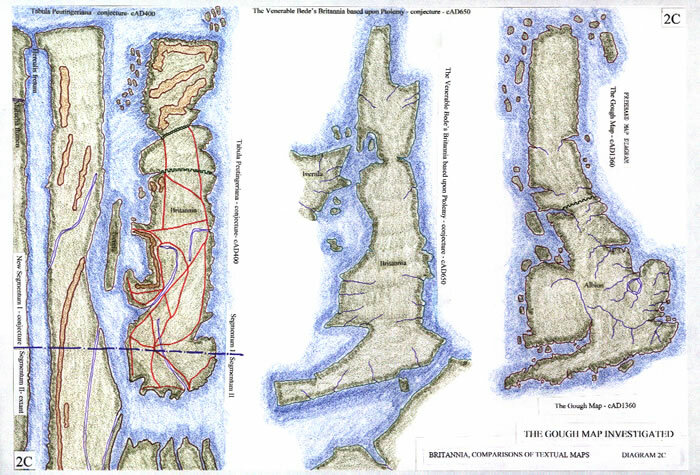 6) Stevenson E L, (1932 & 1991) “Claudius Ptolemy, The Geography”, New York. Caution is required with part of the translation. 7) Steers J A, (1964,) “The Coastline of England and Wales”, 2nd Edition, C U P.
A full description, Cantref-Y-Gwaelod (p148) and Ptolemy’s work (p109). The Roman coastline is discussed for many parts of Britannia. 8) Bede, “Ecclesiastical History of the English People”, Penguin Classics, 1955/1990. See also The Lives of the Saints, Liber 2, chapter 15. Bede, “The Lives of the Saints”. Internet Latin version now available of text. 9) Letts, M, (1975), The Hereford Mappa mundi, The Cathedral Hereford. 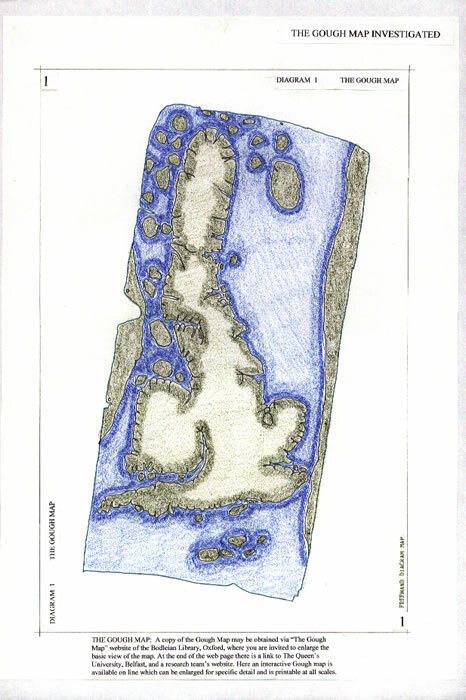 10) Delano-Smith, C and Kain J P, (1999,) “English Maps A History”, The British Library. Pages 40 and 41 set out the time scale for geographical knowledge and the section discusses the Gough map and its contemporaries. 11) The Almagest of Claudius Ptolemy. 12) Woodward, D, (1990), Roger Bacon’s terrestrial co-ordinate system, Annal of the Association of American Geographers, 80, pp102-121. 13) Diodorus Siculus, “Historia”, internet available, out of copyright. Strabo, “The Geography”, internet available, out of copyright. 16) Dilke O A W, (1971,) “The Roman Land Surveyors”, David and Charles. 17) Harley J B, and Woodward D, (Eds. ), (1987) “The History of Cartography”, volume 1. University of Chicago. From antiquity to Roman Maps. 18) Wiseman T P, (1992,),” Julius Caesar and the Mappa Mundi”, in “Talking to Virgil, a miscellany”, Exeter Univ. Press. Pages 22-42. 20) Pliny the Elder, “Natural History”, Penguin Books, London. 21) Sheppard Frere, (1967,) “Britannia”, Routledge and Kegan Paul ltd. The definitive written data on the Roman period of Britannia. 22) Cornelli Taciti,”De Vita Agricolae”, (Eds. ), Ogilvie and Richmond, 1967, Oxford. This contains a map list of the first Roman Forts and routes. 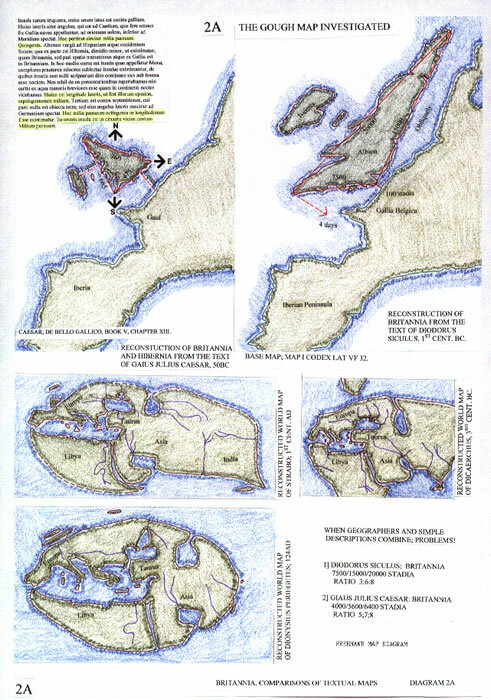 23) Ferrar M J and Richardson A, (2003) “The Roman Survey of Britain”, B.A.R 359. Full details of the putative Survey, with maps and charts included. 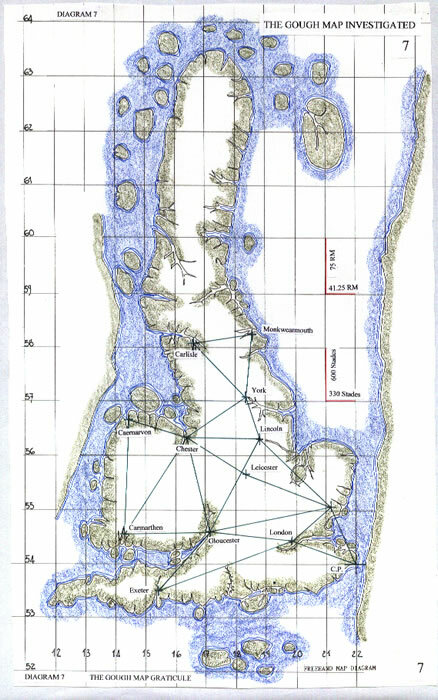 24) The Projection of Ordnance Survey Maps, Chapter 2. Ordnance Survey. 26) Ferrar M J, (2007), “From the Dee/Humber to the Solway/Tyne”. Paper placed on this website explaining the Roman Survey of northern England. 27) Ferrar M J, (2007), “Claudius Ptolemy (Britannia)”, paper placed on this website to explain how the turning of Scotland was achieved and the co-ordinates calculated.